Gravitational waves, ripples in the curvature of space time predicted by Einstein in his General Theory of Relativity, have been detected for a second time. 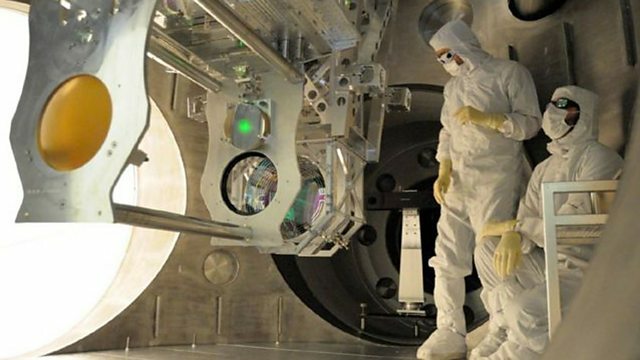 Professor Sheila Rowan, Director at the Institute for Gravitational Research, explains what is new about these latest gravitational waves. Forecasts from the UK Met Office say carbon dioxide levels have seen a surge in recent months as a result of the El Niño climate phenomenon, which has warmed and dried the tropics. Professor Richard Betts explains. Infectious diseases such as Zika originate in animals. Another is Middle Eastern Respiratory Syndrome which originates in camels. Researchers have just highlighted which animals are harbouring them. 40 years ago, The Selfish Gene, by Richard Dawkins was published. In it, Dawkins explains that the gene is the unit of natural selection. Adam Rutherford discusses the impact of The Selfish Gene with Richard Dawkins and Yan Wong. We know more about the surface of the moon than we know about the ocean floor. Roland Pease reports on the latest meeting of cartographers in Monte Carlo to discuss plans to map the ocean floor by 2030. Terahertz radiation, or T-rays, which can be used to scan for tumours and weapons and can even see though solid objects were thought to have limitations with high imaging resolutions. Researchers have developed a new terahertz camera that can see at a microscopic level. Ann Jones flies north to Shanghai as shorebirds from as far away as Australia, Indonesia, Thailand, Myanmar and Bangladesh arrive on the coast of the Yellow Sea. She reports on efforts to save the birds.